There is little to be seen in our woods at present, and that is because of an unseasonably cold spring season - temperatures here are still only a little above freezing during the day, and sometimes well below zero at night. 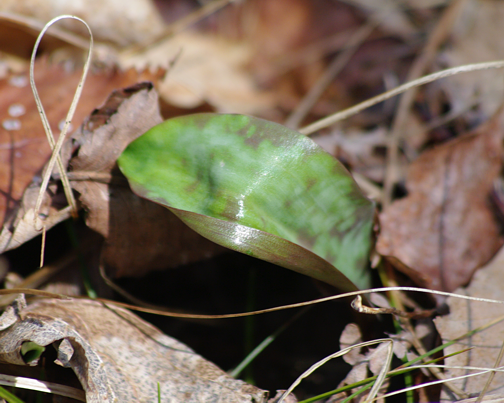 We are probably about a month behind when it comes to wildflowers blooming and new leaves popping out, and there is no sign yet of my favorite early bloomer, Bloodroot (Sanguinaria canadensis) with its snowy petals, golden heart and artfully scalloped enfolding leaves. There are (however) delightfully mottled Trout Lily (Erythronium americanum) leaves showing up here and there, and yesterday morning I found a single tiny clump of Spring Beauty (Claytonia virginica) blooming in a sheltered nook in the eastern gorge, also the delicately feathered blue-green leaves of Dutchman's Breeches (Dicentra cucullaria) nearby. I had brought along a field notebook and marked each specimen carefully on a grid of the Two Hundred Acre Wood - these are the first entries in this year's careful study of native wildflowers, weeds and herbs. Every year another study begins, and there is always something new and wonderful. For all the cold temperatures and wind, there were woodpeckers, brown creepers and amorous chickadees cavorting in the trees, exuberantly drumming grouse on hollow logs in the woods, vultures soaring in high lazy circles over our heads. Surely, we need only be patient for a little longer, and springtime will truly arrive, strewing warmth, sunlight and green leaves everywhere. Beautiful gathering early spring earth and animal delights. Thank you for a lovely post. I derived a great deal of entertainment from finding the scientific names on Wikipedia, where pictures abound; and I found that Dutchmen's britches have "a disjunct population" near me, in the Columbia River basin! I think we are sending warm weather your way this week. 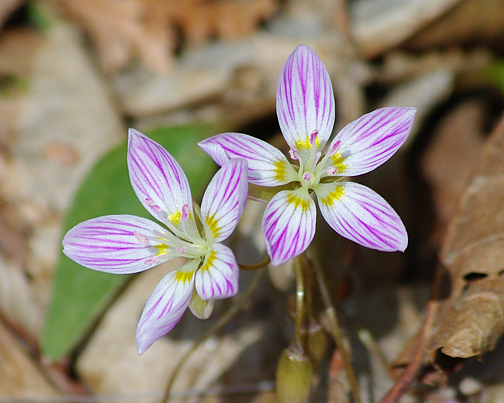 I have a soft spot for trout lilies (because of the Lily part) and my h does for spring beauties. Thank you for the pics!